Groups like B'tselem have been acting as "enablers" for Arab youths to engage in terrorist rock throwing, says Almagor head Meir Indor. The B'tselem report claimed that Israeli police have been abusing the rights of Arab youths suspected of throwing rocks at Israeli drivers and passerby in several neighborhoods of Jerusalem, especially the City of David neighborhood (Silwan). The report claims that police forcefully invaded the homes of several suspects, rousing them from their beds, and prohibiting their parents from being present during their questioning as required by Israeli law. In addition, the report said that many of the youths had complained that police assaulted them as they were being arrested. “We are certainly not for the abrogation of individual rights for criminals,” Indor told Israel National News. 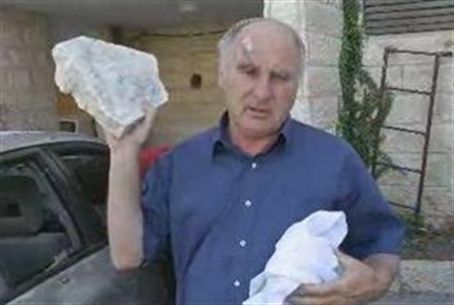 “But the rock throwing by Arab youths is far more than criminal – it's nothing less than an act of war. It's become all too common, and it's life threatening.” Indor himself was injured by a large rock thrown at him by Arab youths on the Mt. Of Olives in October. In that sense, said Indor, B'tselem is working against Israel's interests – and, rather than be permitted to continue harming Israel's security by defending terrorists, the organization should be brought up on charges of treason. “B'tselem has a huge budget, much of it supplied from abroad. Police know who these people are, but are powerless to stop them.